There’s something refreshing about the debut EP from Edinburgh indie/folk quartet, Shooting Stansfield. While sure ‘We Know Not What We Do’ may not necessarily any break new ground, there’s an organic quality, a sweet simplicity, and an earnestness to the songs that make for a welcome change in a sea of soundalikes, current trends, or banal reproductions. Shooting Stansfield are Stewart Douglas (guitar, vocals), Stephen Whipp (lead guitar, backing vocals), Craig Robertson (bass, backing vocals) and David Steel (drums and percussion) and together they make they kind of music that sits comfortably alongside the likes of Frightened Rabbit, Snow Patrol, and the more mellow material of Biffy Clyro. 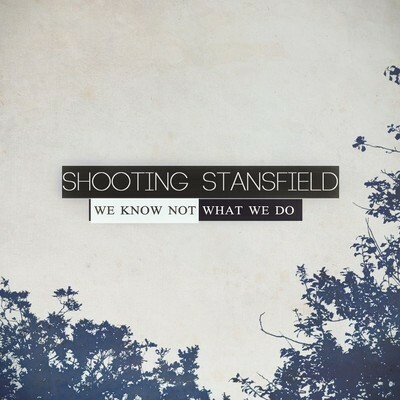 With just bass guitar, drums, acoustic guitar, and clean electric guitar, Shooting Stansfield’s sound is a simple one. Paired with the melodic Scottish lilt of Stewart Douglas, which give the songs charming quality, the quartet proves that some times all you need is great melodies and good songs. Their writing is well crafted and tasteful and while there are certainly catchier folk-rock acts around, one of the most appealing qualities to Shooting Stansfield is that they avoid the obvious huge stadium sing-a-longs electing for a more subdued and restrained option. Opening track “Blue Turns Black” will immediately draw comparison to Frightened Rabbit and Snow Patrol but the band’s integrity cannot be denied. The most immediate and hooky song on the EP, “Blue Turns Black” along with closing track, “State of Mind”, is also the most rocking. “Greater or Lesser” follows next and is a brilliant, tuneful and passionate folk-rock number that evokes hints of Ben Howard. Characterised by its up-tempo drum shuffle, tasty bass work and rhythmic acoustic guitars, “Greater of Lesser” is an EP highlight. The gorgeous “Sign of the Times” continues with the folk from the previous track and from the opening seconds it’s guaranteed to form a lump in your throat. While the EP as a whole has a timeless yet nostalgic quality, there’s something extra special about this track. The time signature of the drums against the flow of the guitars gives the song a traditional, bonafide folk feel. The opening couple of minutes on both “Satellites” and “There Are No Greater Truths” are the most moving. The latter evolves into a more Biffy Clyro-like territory while both tracks also introduce distorted guitars into the mix. However rather than rocking out, the distorted guitars add texture more than grunt. ‘We Know Not What We Do’ is a heartfelt and earnest EP unaffected by the trends of 2013. A thoroughly enjoyable and refreshing EP. ‘We Know Not What We Do’ will be released on 7 June, 2013.